INTRODUCTION: Cord blood transplantation is valuable alternative for bone marrow transplantation and is used for the treatment of over 80 disorders. Cord blood transplant contains significantly lower number of total cells and CD34+ cells compared to bone marrow and mobilized peripheral blood stem cell grafts. Because the higher number of nucleated cell doses per kg of weight correlates with better outcomes, for improving cord blood transplantation results and overcoming of the delayed engraftment, in the last two decades many preclinical and clinical studies of cord blood cell expansion have been carried out. These studies have elucidated mechanisms of cord blood ex vivo expansion and of the rationale of use of expanded cord blood for transplantation. MATERIALS AND METHODS: Online search of terms: “cord blood expansion”, “cord blood stem cells”, “cord blood transplantation” was carried out in Pubmed, Clinicaltrials.gov and google.com. RESULTS: Reports, which contained the main achievements in area of cord blood expansion and expanded cell use for clinical transplantation, were reviewed. The selection of appropriate media, cytokine combinations, sera, additives (such as TEPA or Notch ligands), coculture with supportive cells, such as mesenchymal and endothelial stem cells and 3D scaffolds resulted in dramatic improvement of cord blood stem cell expansion. Clinical trials with expanded cord blood for malignant hematological disorders were started and results showed that expanded cell transplantation is feasible and improves neutrophils and platelets engraftment time. CONCLUSIONS: The successful ongoing studies with novel strategies (new media, addition of the new growth factors to standard early acting cytokines, 3D strategy with supportive cells) show that the problems of smaller number of cord blood cells and delayed engraftment could be resolved in the near future. Cord blood is a valuable source of hematopoietic stem cells and alternative for bone marrow transplantation. The first transplantation of cord blood was carried out in 1988 1. At 2013 more than 30000 transplantations were accomplished 2. Umbilical cord blood contains similar cell populations to bone marrow and peripheral blood mobilized stem cell products: hematopoietic stem cells, progenitor cells and differentiated functional cells. The total cell number in the cord blood transplant is lower compared to other sources. Bone marrow and peripheral blood mobilized stem cell grafts should contain approximately 108 CD34+ cells, while cord blood graft only 5 x 106 CD34+ cells. The number of nucleated cells per kg of weight of the patients correlates with outcome. The minimal dose of transplanted cord blood total nucleated cells (TNCs) for hematological disorders is 20-25 million/kg weight 3. It was suggested that a minimum cryopreserved TNC dose in cord blood transplant should be 2.5 x 107 cells/kg for a single unit with 5/6 matched graft, and 5 x 107 cells/kg for a single-unit 4/6 matched graft in patients with malignancies 4. But when no grafts with higher cell doses or other stem cell sources are available, cord blood grafts containing 1,0- 2.0 x 107cells/kg could be useful 5. In comparison, for bone marrow transplantation 1.5-3 x 108 nucleated cells/kg and for peripheral blood mobilized cells 2-7 x 108 mononuclear cells/kg are recommended 6. Therefore, cord blood hematopoietic stem cells (HSCs) seem to be more potent than HSCs from adult bone marrow and peripheral mobilized blood. There does not appear to be any long-term engraftment problems to recipients of cord blood, though they have delayed neutrophil and platelet engraftment in comparison to bone marrow transplanted patients 7 , 8. The cord blood stem cells also survive in culture longer and proliferate better. It was demonstrated that cord blood CD34+ cell expansion in cultures was 31-250-times better than the expansion of bone marrow CD34+ cells over the same culture conditions and period. A higher incidence of colony-forming cells with greater proliferation capacity in cord blood over bone marrow CD34+ cells was also reported 9. Nonobese-diabetic severe combined immunodeficient (NOD/SCID) mice transplanted with cord blood mononuclear cells (MNCs) showed significantly higher levels of chimerism than those transplanted with bone marrow MNCs 10. When transplanted in vivo, cord blood has greater repopulating ability than bone marrow or mobilized peripheral blood. The greater repopulating ability of cord blood is due to the higher generative ability of cord blood HSCs 11. According some researchers, the main cause of delayed neutrophil and platelet recovery after cord blood transplantation (for neutrophils – mean 18 days in bone marrow transplantation group and mean 32 days in cord blood transplantation group, for platelets: mean 29 days and mean 81 days, respectively), is the low number of short-term engrafting cells or mature progenitor cells 12 , 13.There are clinical evidences that patients who receive higher doses of TNC and CD34+ cells, engraft faster than do patients who receive lower doses 14.The ex vivo expansion of cord blood cells is important way to overcome the relatively low number of cells in cord blood unit. This paper reviews the preclinical experiments of cord blood HSCs expansion and clinical studies with use of ex vivo expanded cord blood. Maintenance of stem cell pool throughout the life requires the asymmetric division, when one progeny cell retains stemness and other differentiates. Ex vivo expansion of stem cells requires a symmetric division, when both daughter cells should maintain properties of stem cells. Correct balance of cytokines, medium, sera and other active substances used for expansion is extremely important. The final goal of cord blood expansion is to generate clinically safe, transplantable HSC’s, which can repopulate recipient. The acceptable alternative could be ex vivo generation of more mature progenitors, which would be able to engraft rapidly. The initial efforts on HSC expansion were done in the 1970s. Researchers used bone marrow in liquid culture system 15 , 16 , 17 , 18. Bone marrow-derived adherent cells supported prolonged proliferation and differentiation of genetically incompatible stem and precursor cells. In the similar systems with prosimians normal hematopoiesis has been sustained in vitro for more than 1 year 19. Many efforts were done to expand cells in order to retain stemness versus differentiation with use of either cytokines or stromal cells, or their combination. Usage of stromal cell mimicries stem cell niche and specific microenvironment, necessary for cell survival and proliferation. The long-term engraftment and subsequent reconstitution of normal hematopoiesis occur if the HSCs home to specialized niches of the bone marrow. HSCs do not grow as autonomous units. They are surrounded by the marrow microenvironment, defined by the cell-cell interactions, cell-extracellular matrix interactions and by the growth factors. The bone marrow microenvironment contains fibroblasts, smooth muscle cells, endothelial cells and mesenchymal stem cells. They provide a scaffold to the stem cells and produce transmembrane ligands, extracellular matrix components and soluble proteins. HSCs are located in the endosteal osteoblastic niche attached to spindle-shaped N-cadherin+ CD45- osteoblastic (SNO) cells. The homing is a crucial moment of transplantation. Two processes are important: stem cells adhesion to the endothelial cells and migration across them into niche after adhering to the vessel wall. Adhesive molecules fix HSCs to their niche. They also provide signals to quiescent HSCs in an undifferentiated state – in G0 stage. Growth factors start HSC cell cycle entry. The SNO cells provide inhibitory signals (BMP, Jagged and Ang-1) to protect HSCs from differentiation and apoptosis. HSCs express very late activation antigen-4 (VLA-4 or CD49d), VLA-5 (CD49e) and lymphocyte function associated antigen-1 (LFA-1 or CD11a), which adhere to vascular cell adhesion molecule-1 (VCAM) and fibronectin of SNO. The non-integrin adhesion receptor, lymphocyte homing associated adhesion molecule (HCAM or CD44) and stromal cell-derived factor (SDF-1) also play important roles in engraftment 20 , 21 , 22. The cytokines in cell culture system can have influence on total nucleated cell and stem cell expansion, long-term donor engraftment and leukocytes and platelets recovery speed. The most important cytokines and their optimal concentration for HSC blood stem cell expansion were determined 23. Most protocols of cord blood expansion involve stem cell factor (SCF), thrombopoietin (TPO), IL-3, IL-6, Flt3-ligand. In stroma-free culture systems SCF and Flt3-ligand maintain HSCs 24. TPO supports the expansion of both short- and long-term repopulating HSCs. They can be significantly expanded, rather than maintained 25. Cytokine components affect recovery of different cell lineages 26. Stem cell factor (SCF) or c-kit ligand. This cytokine is a hematopoietic growth factor and exerts its activity by signalling through the c-Kit receptor. Up to 3% of cord blood cells express C-kit (tyrosine-protein kinase kit, CD117) 27. Treating of cord blood CD34+ stem cells with SCF improved homing of cord blood cells in NOD/SCID mice models. The delayed hematopoietic reconstitution after umbilical cord blood transplantation could be result of significantly lower levels of CD49e, CD49f, and CXCR-4 on cord blood CD34+ cells than on counterparts from peripheral blood and bone marrow 28. Short-term treatment of cord blood-derived CD34+ cells with SCF resulted in upregulation of the homing-related molecules and increased ex vivo transmigratory and in vivo homing potential of cord blood stem cells 29. Flt3-ligand. This cytokine regulates early hematopoietic cell proliferation. It binds to the hematopoietic cells expressing the tyrosine kinase receptor Flt3/flk2. It was demonstrated that Flt3-ligand is essential for expansion of the early stem cells (CD34+ Thy-1+ CD45+) 30 and enhances adhesiveness by activation and increased expression of CD49d and CD49e, which are important in proliferation and differentiation 31. Thrombopoietin (TPO) has an important role in regulation of primitive hematopoietic cells. TPO signals through the c-mpl receptor. HSCs from fetal liver, cord blood, bone marrow and mobilized peripheral blood express c-mpl on their surface at high density 32. The addition of TPO as a single cytokine to bone marrow hematopoietic cells had dramatic effects and resulted in the generation of both long- and short-term repopulating HSCs 33. IL-6. This cytokine plays an important role in host defense by regulating immune and inflammatory responses. IL-6 also acts in synergy with SCF and Flt3-ligand. IL-6 maintains immature phenotype of hematopoietic stem cells. The addition of IL-6 to SCF, Flt3-L, TPO, IL-3 combination caused better ex vivo expansion of cord blood CD133+ cells 34. IL-3 is a growth factor that promotes the survival, differentiation and proliferation of different lineages of committed progenitors. IL-3 increases total expanded cell count, expands human mature blood cells and hematopoietic progenitor cells (HPCs), but has an inhibitory effect on the expansion of long-term-repopulating HSCs and often were reported that this cytokine can play a negative role in primitive cell expansion. It was demonstrated that TPO + SCF + Flt3-ligand expanded mobilized peripheral blood CD34+ fraction maintain multilineage engraftment ability in NOD/SCID mice, which is abrogated by the addition of IL-3 35 , 36 , 37. The number of SRC is the crucial parameter for the predicting of the repopulating ability of native or expanded human hematopoietic stem/progenitor cells after transplantation into patients receiving high-dose radio- or chemotherapy. The SRCs represent very primitive hematopoietic cells and are exclusively CD34+CD38-, while colony forming cells (CFC) and long-term culture initiating cells (LTC-IC) could be found also in the CD34+CD38+ fraction 38 , 39 , 40. To find the cytokine combination for the stem cell expansion without change in repopulating potential, CD34+CD38-Lin- cord blood cells were cultured with several cytokines. It was demonstrated that SCF+ Flt3-ligand is the minimal necessary growth factor combination and TPO can replace IL-3, IL-6 and G-CSF without changing. Though TNC expansion and CD34+ cell percentage were different for each cytokine cocktail: SCF+Flt3-ligand+IL-3+IL-6+G-CSF (447-fold and 22.5%, respectively), for SCF + Flt3-ligand combination (14-fold and 48.8%, respectively) and for SCF + Flt3-ligand + TPO combination (241-fold and 29.7%, respectively), the transplantation of cultured cells in each condition resulted in multilineage hematopoietic repopulation in NOD/SCID mice and all protocols supported similar frequencies and levels of human hematopoietic engraftment 41. Expanded human cord blood CD34+ cells (with cytokine combination: SCF+Flt3- ligand+TPO+complex IL-6+soluble IL-6 receptor) were successfully repopulated in NOD/SCID mice. After 10–12 weeks of transplantation in the bone marrow of 13 from 16 transplanted mice the human CD45+ cells were detected. The proportion of CD45+ cells in bone marrow of expanded cell recipient animals was 11.5% of all bone marrow cells – 10 times higher than in those receiving comparable numbers of fresh CD34+ cells42. Sublethally irradiated NOD/SCID mice were transplanted with cryopreserved unmanipulated CD34+ cord blood cells or expanded CD34+ cord blood cells. For up to 10 weeks expanded cells were engrafted better in comparison with the same numbers of unmanipulated cells. The combination of SCF (50 ng/ml) + Flt3-ligand (50 ng/ml) + TPO (20 ng/ml) + IL-6 (10 ng/ml) was superior. In this combination SRCs are expanded 960-fold after 9 to 10 weeks of expansion43. In another study, on the feeder cells (AFT024) plus Flt3-ligand + SCF + IL-7 or Flt3-ligand + TPO expanded CD34+ cord blood cells were engrafted in primary, secondary and tertiary xenogeneic hosts: NOD/SCID mice or fetal sheep. SRCs with multilineage differentiation potential were maintained in both systems for up to 28 days. Marrow from mice was highly engrafted by expanded cells, induced multilineage human hematopoiesis in 50% even in secondary recipients. Cells, which were expanded for one week, engrafted primary, secondary, and tertiary fetal sheep 44. The apoptosis rate during expansion depends on cytokine combination. In expansion study on mobilized peripheral blood CD34+ Thy-1+ cells the combination of SCF, TPO and Flt3-ligand resulted in the less number of apoptotic cells and slight increase of CD34+ Thy-1+ cells, while leukemia inhibitory factor (LIF) along with IL-3 and IL-6 reduced the number of CD34+ Thy-1+ cells to 30% of initial count 45. Telomerase activity and telomere length were studied in the long-term culture expanded CD34+ cells. Cord blood cells were cultured either on adenovector transduced stromal cells, expressing TPO, or stimulated by a cytokines (SCF, FL, TPO and IL-6) without stromal cells. Telomere length in the cultivated CD34+ cell population in the first 6 weeks of expansion was increased, remained stable up to 16 week and then diminished slightly. The telomerase activity in the first weeks was also increased,thereafter decreased 46. The surface phenotype of stem cells during expansion can be changed because of action of growth factors and may not give fully adequate information on the cells. The expression of cell surface antigens and receptors, responsible for cell migration and adhesion, could be altered during expansion and, theoretically, could cause change of the homing properties and engraftment of expanded cells. But several experimental data showed that homing potential of expanded cells remained unaltered. It was reported that one-week ex-vivo expansion at least preserves cord blood stem cell homing-related characteristics and migration activities.Isolated CD34+ cells from the fresh or cryopreserved haematopoietic stem cells were expanded with Flt3-ligand, SCF and TPO ± IL-3 cocktail. Most freshly purified CD34+ cells expressed CD49d and CD44. The expression of these receptors on the expanded CD34+ cells was increased or remained similar to the fresh cord blood CD34+ cells. Both spontaneous and SDF-1-induced adhesions were highest on day 10 and then declined on day 14. Spontaneous migration quickly decreased in the second week of expansion. On day 14 expanded CD34+ cells showed hardly any spontaneous migration over filters. The SDF-1-induced migration on day 10 was comparable to that on day 0, but was significantly lower on day 14 47. There are data that genetic characteristics, at least karyotype, of expanded cord blood stem cells (CD34+/CD38-) after 20 and 43 days in culture, are preserved 48. Gene-expression of expanded cord blood stem cells was determined by the Affymetrix microarray system in study on influence of collagen I presence on cord blood CD34+ cell expansion. The significant differences in the molecular signature between suspension cultures and HSC cultures with collagen gel were found. Upregulation of many genes, including a high number of cytokines or chemokines: IL-8, IL-1α, IL-1b, TNF-α and MIP-1α, which have influence on the proliferation and mobilization of HSCs, was detected. Collagen imitated the HSC niche microenvironment and induced the secretion of mediators by HSCs and/or progenitor cells 49. 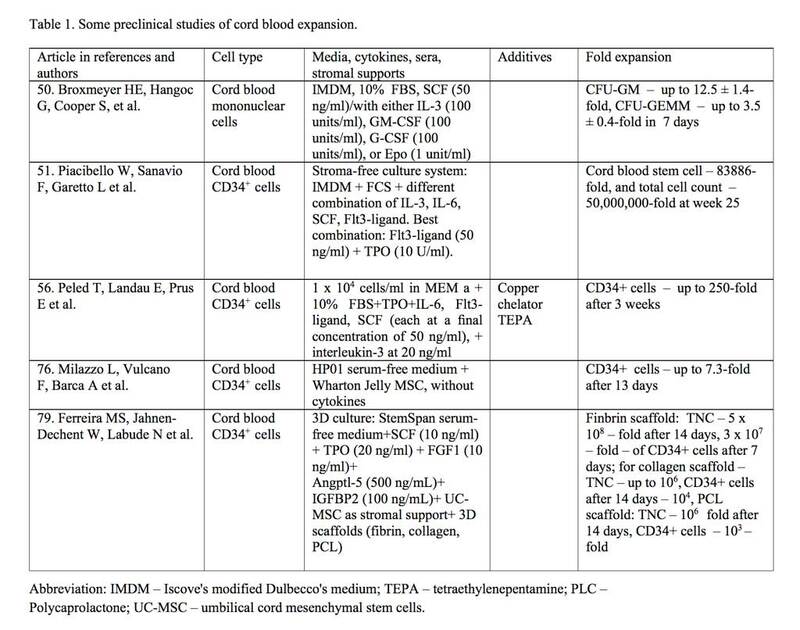 Results of some preclinical studies on cord blood expansion are shown in Table 1. The first attempt to expand cord blood haematopoietic stem cells was done by Hal Broxmeyer in 1992. Umbilical cord blood mononuclear cells were expanded in Iscove’s modified Dulbeccos’s medium (IMDM) with FBS and SCF alone or with either IL-3, GM-CSF, G-CSF or Epo for 7 days. In the experiment with SCF alone CFU-GM was increased 7.9 ± 1.1-fold, with SCF plus any other cytokines – 12.5 ± 1.4-fold, BFU-E – respectively 2.2 ± 0.2-fold and 3.6 ± 0.7-fold, CFU-GEMM – respectively 2.7 ± 0.4-fold and 3.5 ± 0.4-fold 50. Later several groups developed stroma-free culture systems supplemented with multiple early acting cytokines. In long-term culture system purified cord blood CD34+ cells were cultured in IMDM supplemented with FCS and several cytokines (IL-3, IL-6, SCF, Flt3-ligand, alone or in a combination). The best result was achieved by using of combination Flt3-ligand (50 ng/ml) plus TPO (10 U/ml). This combination was capable of sustaining for more than 6 months proliferation and renewal of cord blood primitive stem cells. In the long-term culture-initiating cells assay (LTC-IC) expanded primitive stem cell number at week 25 was increased 83886-fold, total cell number –50,000,000-fold, CD34+ and CD34+CD38-cells were expanded in the similar ways 51. Cord blood stem cells were expanded with the different ligands for Notch pathway activation. Notch signaling is a crucial for the onset of deﬁnitive hematopoiesis in the embryos 52. Notch-1 receptor ligands had influence on CD34+ cell expression in human cord blood. Lower densities of Notch ligand Delta1 enhanced the generation of human cord blood stem CD34+ cells, while the higher densities resulted apoptosis of CD34+ cells. Notch-mediated ex vivo expansion system was developed, which markedly enhanced the absolute number of cord blood CD34+ cells and their repopulation ability in the marrow of NOD-SCID mice 53. Recently Delaney and colleagues developed clinically relevant Notch-mediated ex vivo expansion system for human CD34+ cord blood progenitors in StemSpan serum-free medium with IL-3, IL-6, TPO, Flt3-ligand and SCF. Cultivation resulted in a marked increase of absolute number of stem/progenitor cells, which were infused in ten patients with high-risk acute leukemia after a myeloablative preparative regimen. The time to neutrophil recovery was shortened – in a phase I trial transplantation the median time for neutrophil recovery was 16 days instead of expected 23 to 26 days 54. De Lima et al 55 transplanted patients with AML/MDS (n=21), ALL (n=6), NHL (n=2), CLL (n=2), and HD (n=1) with expanded cord blood cells. Double transplantation of unmanipulated and expanded cord blood units, matched in at least 4/6 HLA antigens, with a minimum of 1×107 TNC/kg per unit was carried out. For 14 days cord blood was expanded on confluent layer of mesenchymal stem cells (MSCs) together with cytokines: SCF, Flt-3 ligand, G-CSF, and TPO. The expanded cells were infused along with a second unmanipulated cord blood unit. The median number of TNC and CD34+ cells/kg in unmanipulated cord blood was 2.35 × 107 and 0.95 × 105, respectively. The median number of expanded cells and CD34+ cells/kg was 5.8 × 107 and 8.7 × 105, respectively. A median expansion of cord blood cells was 14-fold for TNC and 40-fold for the CD34+ cells. A median time to neutrophil and platelet engraftment of 15 (range 9-42) and 40 (range 13-62) days, respectively were reported. After 21 days chimerism analysis demonstrated that cells from expanded units were significantly represented in recipients: 19%, 16% and 14% of mononuclear, T lymphocyte and myeloid cell populations were derived from expanded donor cells. One-year survival was 40%. This method led to fast engraftment of neutrophils and platelets, and high-rates of platelet transfusion independence. Cord blood was expanded with the copper chelator tetraethylenepentamine (TEPA), which diminishes cord blood stem cell differentiation and augments the expansion potential of cord blood-derived progenitor cells, because cellular copper supports stem cell differentiation. TEPA along with early acting cytokines (TPO, IL-6, Flt3-ligand and SCF) resulted in a proliferation of mature, committed cord blood cells (CD34+Lin+) and colony-forming units cells (CFUc) as well as robust expansion of the CD34+CD38- and CD34+Lin- subpopulations 56 , 57. Human progenitor cells, expanded with TEPA, engrafted significantly better in SCID mice, than the same number of the unmanipulated or without TEPA expanded cells 58 , 59. After preclinical studies I/II phase clinical trial was launched. Cord blood CD133+ cells were expanded with TEPA and cytokines for 21 days and transplanted in acute leukaemia and lymphoma patients. The unexpanded cells of the same cord blood units were infused 24 h earlier. Cord blood units and patients were matched at 4 or 5 HLA loci. Though the median total number of infused TNC per kg weight was only 1.8 x 107, 90% of patients engrafted, no severe GVHD was reported. Netrophil and platelet engraftment time was 30 and 48 days, respectively, and 100-day survival was 90% 60. Could the expanded cord blood overcome the delayed engraftment of cells, particularly in adult patients? Abilities of expanded cord blood in shortening time to engraftment and reducing the graft failure rate were studied in one clinical trial, where ex vivo expanded cord blood were transplanted in 37 patients. 12 children and 25 adults (23 of them had progressive refractory disease at study entry), with hematologic malignancies (34 patients) or breast cancer (3 patients) treated with high-dose chemotherapy followed by cord blood transplantation, matched or mismatched at 1 or 2 alleles. No minimal cord blood cell dose requirement was established, though attempts were made to obtain cord blood which had ≥1 x 107 TNC/kg in unit. A cord blood CD34+ cells were expanded for 10 days in medium with SCF, G-CSF and TPO. Median expansion was 4-fold. The remainder of the cord blood graft was infused without further manipulation. Each patient was transplanted with a median of 0.99 x 107 TNC/kg (together expanded and unexpanded). The median engraftment time for neutrophil was 28 days, for platelets – 106 days. Extensive acute and chronic GVHDs were described in 40% and 63% of patients, respectively. After 30 months 35% of patients survived, among children 58% event-free survival rate was documented, which was similar to matched sibling donor transplantation survival rate 61. In the other study, patients with AML/MDS (N=25; 35%), ALL (N=17; 24%), NHL (N=10; 14%), HD (N=7; 10%), CML (N=5; 7%), and CLL (N=7; 10%) were transplanted with double cord blood unit. The majority of cord blood units were 4/6 HLA matched. From the smallest unit selected CD133+ cells were cultured for 14 days in media containing SCF, G-CSF and TPO. The T cell-containing CD133-negative fraction was frozen. Median TNC expansion was 23-fold, CD34+ cell expansion – 2.3-fold. On day 0, the unmanipulated unit was infused, followed by the CD133-negative and the expanded fractions. Infused median TNC was 3.6 x 107/kg and median CD34+ cell count – 1.8 x105/kg. Patients, who received expanded cells and a reduced-intensity regimen, engrafted neutrophils in a median of 7 days (range, 4-15 days; n=14) versus 14 days (range, 5-32 days; n=12) in the unmanipulated transplantation in another 36 patient (p = 0.05). Thirty-four patients were alive (48%) with a median follow up of 11.3 months. Twenty-four patients relapsed (34%). Chimerism analysis showed that ultimately one cord blood unit dominated in all patients, on both the unmanipulated and expanded arms of the trial. The majority of patients had evidence of expanded cord blood posttransplant chimerism (7-82%). In half of those patients, the expanded cord blood unit predominated over the unmanipulated unit for 2-12 months posttransplant (52-87%), followed by gradual predominance of the unmanipulated cord blood unit by 14 months in all patients. One and two years survival in patients of expanded arm were better than unmanipulated arm: 1-year survival rate was 60% and 46% (p = 0.1) and 2-years survival – 55% and 20%, respectively 62. 28 patients were transplanted with expanded allogeneic cord blood at the Duke University, North Carolina. The largest part of cord blood were transplanted unmanipulated (1×107/kg), the rest (1-2×108 cells) were expanded with AastromReplicell Cell system for 12 days in IMDM with PIXY321 (granulocyte-macrophage colony stimulating factor/interleukin-3 fusion protein), EPO and Flt3-ligand. The median fold expansion was of 2.4. The median fold expansion for CFU-GMs was 82.7, for CD34+ cells – 0.5. 27 patients received ex vivo-expanded cells. Patients with malignant (19 patients) or non-malignant disorders were transplanted with 1, 2, or 3 alleles mismatched cells. Augmentation of cord blood transplants with ex vivo-expanded cells did not alter the time to myeloid, erythroid or platelet engraftment in 21 evaluable patients. Recipients of ex vivo-expanded cells had durable engraftment with a median follow-up of 47 months (range: 41-51 months). The infusion of expanded cells was safe 63. Ex vivo cord blood expansion removes stem cells from the microenvironment and needs the addition of cytokines for proliferation. Alternatively, cord blood cells could be cocultured with components of the hematopoietic microenvironment. Ex vivo contact with stromal components of the hematopoietic microenvironment preserves different activity of HSC. It was shown that bone marrow endothelial cells (ECs) are essential for reconstitution of hematopoiesis due to Notch signaling pathway and support long-term expansion of HSC 64. Endothelial and perivascular cells maintain HSCs in bone marrow niche also because of SCF secretion 65. Expansion of cord blood CD34+ cells with SCF, Flt3-ligand, IL-6, VEGF and IL-1, with or without autologous coculture system using umbilical vein endothelial cells (HUVEC) demonstrated that coculture system was superior over liquid culture: after 10 days of cultivation the total cell number increased 77-fold and 10-fold, respectively; CD34+ cell number, coculture with HUVEC, was increased 23-fold, while in liquid culture – only 3-fold 66. Recently was reported cord blood CD34+ cell expansion on HUVEC, modified by introducing a lentiviral vector expressing E4ORF1 gene of adenovirus – E4+EC. This gene enabled long-term survival of endothelial cells in serum-free/growth factor-free conditions. Coculture of cord blood CD34+ cells in direct cellular contact with hECs and minimal concentrations of TPO/Kit-ligand/Flt3-ligand (50 ng/ml each) resulted in a 400-fold expansion of TNCs and 150-fold expansion of CD45+/CD34+progenitor cells over a 12-day period, while cytokines alone resulted in 125-fold expansion of TNCs and 50-fold expansion of CD45+/CD34+ cells. Long-term engraftment of cocultivated cord blood in NSG mice was better than with cytokine expanded cord blood cells 67. The same group has compared E4+EC from HUVEC and mesenhymal stem cell from placenta as a feeder layers for cord blood CD34+ expansion with SCF, TPO and FLT-3 Ligand. In this study both types of feeder layers supported hematopoietic expansion. Endothelial cells triggered amplification of CD34+/CD38−/CD90+ cells, they differentiated into all cell lineages and were capable of engraftment and multi-lineage differentiation in sub-lethally irradiated mice. Mesenchymal progenitors promoted amplification of CD34+CD38+ cells, defined as precursors with more limited differentiation potential 68. MSCs have clinical immunomodulatory activity and influence on graft versus-host disease in transplant patients, build the components of the stem cell niche. In combination with cytokines, MSCs can increase the cord blood hematopoietic progenitor expansion, because provide components for the stem cell niche, which are absent in common liquid cultures. MSCs abolish the need for positive selection, can improve expansion and engraftment. The hematopoietic microenvironment is composed of hematopoietic and non-hematopoietic components, which direct self-renewal and proliferation of stem cells and regulate the differentiation and maturation. Ex vivo contact with MSCs preserve HSC activity. MSCs can be isolated and expanded as adherent cells from a variety of fetal and adult tissues, including cryopreserved cord blood. The efficient expansion protocol has been established for cord blood MSCs (DMEM with human AB serum, Flt-3-ligand, SCF, TPO and IL-6), which enabled long-term expansion. MSC stemness and their differentiation capacity in vitro were preserved throughout long-term culture. After 24 passages 95% of expanded MSCs displayed a fibroblast-like morphology, expressed MSC-related antigens (CD105, CD73, CD29, CD44, CD133), were negative for haematopoietic cell markers (CD45, CD34 and CD140 69. Another source for MSCs is Wharton’s jelly stromal cells after enzymatic 70 or nonenzymatic isolation 71. Wharton’s jelly MSC transplantation along with cord blood HSCs from the same donor could play important role for cell-based therapy in the future and their combined banking should be considered 72 , 73. In several cord blood expansion clinical protocols CD133+ or CD34+ cells are isolated before culture. After this procedure remarkable number of HSCs, as well as huge number of TNC, are lost and even after successful expansion, the final number of cells, available for transplantation, is quite low 74. To show the advantage of unmanipulated cord blood expansion over selected stem cell expansion, two methods were compared: CD133+-selected cord blood cells were expanded in αMEM medium with 10% FBS, and G-CSF, SCF, TPO. After 14 days of culture, cells were harvested and assayed for TNC, CFU, CD133+ and CD34+. Bone marrow MSCs were isolated from healthy donor marrow and cultured in a αMEM supplemented with FBS. After 2-3 days adherent cell culture achieved approximately 70% confluence. Non-selected cord blood, containing initially 109 TNC, were expanded in medium with 20% FBS and G-CSF, SCF and TPO and plated over the pre-established confluent MSC monolayer for 14 days. Up to 1010 TNC were generated. In liquid culture, initiated with the CD133+-selected cord blood cells, after 14 days of expansion, TNC number were increased from 20 mln to 800 mln. Cord blood MSC coculture also generated a significantly greater output of CD133+ cells (>7-fold, p = 0.01), CD34+ cells (>14-fold, p = 0.003), than did ex vivo liquid culture of CD133+-selected cord blood. MSC coculture with cord blood cells without a selection step and thus, without loosing of stem cells, might produce cord blood graft with a better engraftment potential. Cotransplantation of unmanipulated cord blood with expanded cord blood, cocultured with MSCs, could result in a combined graft, containing both hematopoietic progenitor cells, responsible for long-term repopulation (mostly derived from the unmanipulated unit), and in cells, responsible for short-term repopulation (derived from with MSCs cocultured cord blood unit). Such a combination of cord blood units potentially provides the recipient with more rapid and long-term engraftment 75. Wharton’s jelly-derived MSCs supported ex vivo expansion of cord blood CD34+ cells in the absence of exogenous cytokines. After 7 and 14 days coculture the expansion rate of the CD34+ cells was increased by 2.0 and 7.3 times, respectively. In particular, CD34+/CD90+ and CD34+/CD33- populations were increased. Expanded cells were transplanted in NOD/SCID mice. After 8 weeks human CD45+ cell percentage in mouse bone marrow was evaluated as engraftment marker. For 7 days expanded cells engrafted better than unmanipulated cells 76. New cytokines were used for the preclinical studies. Three new growth factors, secreted by the endothelium – Angiopoietin-like 5 (Angptl5), IGF-binding protein 2 (IGFBP2) and pleiotrophin in combination with conventional cytokines enhanced HSC expansion. Pleiotrophin is an 18-kDa heparin-binding growth factor. Its addition to the combination of TPO, SCF and Flt3-ligand significantly increased CD34+/38-/Lin- cell number. Immunodeficient mice in three different experiments were transplanted with uncultured human cord blood CD34+/38-/Lin- cells and with expanded CD34+/38-/Lin- progenies, cultured with or without pleiotrophin. At 4 and 8 weeks after transplantation with pleiotrophin expanded cells significantly improved engraftment of NOD/SCID mice in comparison to transplantation with uncultured CD34+CD38−Lin−cells or with the progeny of cells cultured with TPO, SCF and Flt3-ligand alone. Thus, pleiotrophin increased number of SRCs among cord blood stem cells 77. Addition of angiopoietin-like 5 or IGF-binding protein 2 to SCF, TPO, FGF-1 in a serum-free culture led to a sizable expansion of HSC numbers, assayed by NOD/SCID transplantation: 20-fold expansion of SRCs in cord blood CD133+ cell culture was reported 78. Most of the current hematopoietic culture systems use two dimensional expansion strategies for cell expansion, even if these systems mimicry niches by use of MSCs or endothelial cells. But in reality the niche is three dimensional, where stem cells are interacting with extracellular matrix and several types of supportive cell. The usage of 3D polymers for HSC expansion has been studied recently. 3D scaffold increases the cell growth area, provides structural support, and improves cell-to-cell contact, thus fulfills the important requirements of the niche. Cord blood CD34+ cells were expanded on different type of 3D biomaterial scaffolds (polycaprolactone (PCL), poly-lactic-co-glycolic acid (PLGA), fibrin and collagen) in combination with umbilical cord MSCs and cytokine cocktail in StemSpan medium: SCF, TPO, FGF-1, angiopoietin like-5(Angptl-5), IGFBP2. Expanded cells were transplanted into NSG mice. All scaffolds but PLGA supported cord blood CD34+ cell expansion. Cells in fibrin scaffold reached the highest growth (5 × 108-fold expansion of total nuclear cells after fourteen days and 3 × 107-fold expansion of CD34+ cells after seven days), maintained a more primitive immunophenotype for more cell divisions and exhibited superior migratory and adhesive properties, showed the significantly higher numbers of engraftment and multilineage differentiation (CD45, CD34, CD13, CD3 and CD19) in bone marrow, spleen and peripheral blood in long-term transplanted NSG mice compared to the other 3D biomaterial scaffolds 79. Currently cord blood HSCs were expanded on extracellular matrix, synthesized after decellularization of ex vivo expanded stromal cell structure. In such system with standard cytokines (TPO, Flt3-ligand, SCF and IL-6 in Stemline II medium) HSC expansion rate reached 85-fold after 7 days 80. Studies for cord blood HSC expansion for clinical use will be actively continued in the near future. The development of the new growth factors, cytokines, biologically active substances and additives for expansion of stem cells, which maintain their undifferentiated condition, the new biopolymers for stem cell expansion on 3D scaffolds, which mimicry HSC niche, new media for optimal expansion of cord blood HSCs, coculture with autologous or allogeneic supportive cells (MSCs from different sources: cord blood, amnion, chorion, Wharton’s jelly; endothelial cells), culture in the new bioreactors with improved pH, O2, CO2, glucose control, feeding, aeration and agitation control, will improve stem cell expansion outcome. The generation of routine expansion method for optimal number of cord blood HSCs, which are clinically safe, engraft long-term and rapidly recover recipients bone morrow in several days is the main goal of cord blood expansion. The developments of the last decade made this goal more realistic than ever before. The Authors declare that they have no conflict of interests. No financial support was received from any source for the manuscript. Gluckman E, Broxmeyer HA, Auerbach AD, Friedman HS, Douglas GW, Devergie A, Esperou H, Thierry D, Socie G, Lehn P, et al. Hematopoietic reconstitution in a patient with Fanconi’s anemia by means of umbilical-cord blood from an HLA-identical sibling. N Engl J Med 1989; 321(17):1174-1178. Ballen KK, Eliane Gluckman E, Broxmeyer HE. Umbilical cord blood transplantation: the first 25 years and beyond. Blood 2013; 122(4): 491-498. Gluckman E, Rocha V. Cord blood transplantation: state of the art. Haematologica 2009; 94(4): 451-454. Barker JN, Scaradavou A, Stevens CE. Combined effect of total nucleated cell dose and HLA match on transplant outcome in 1061 cord blood recipients with hematological malignancies. Blood 2010;115(9): 1843-1849. Takahashi S, Ooi J, Tomonari A, Konuma T, Tsukada N, Tojo A, Yamaguchi T, Asano S. Posttransplantation engraftment and safety of cord blood transplantation with grafts containing relatively low cell doses in adults. Int J Hematol 2006; 84(4): 359-362. Guidelines for the collection, processing and storage of human bone marrow and peripheral stem cells for transplantation. Prepared by the BCSH Blood Transfusion Task Force. Transfus Med 1994; 4(2): 165-172. McNiece IK, Shpall E. Ex Vivo Expansion of Cord Blood. PP. 91-96. Chapter 4, in Book Frontiers of Cord Blood Science. Bhattacharya N, Stubblefield Ph. Springer Verlag London, 2009. McNiece IK. Ex Vivo Expansion of Cord Blood Hematopietic Cells. PP. 77-88. Chapter 4, in Book Umbilical Cord Blood. A Future for Regenerative Medicine? Kadereit S, Udolph G. World Scientific, Singapore, 2011. Lansdorp PM, Dragowska W, Mayani H. Ontogeny-related changes in proliferative potential of human hematopoietic cells. J Exp Med 1993; 178(3): 787-791. Kim DK, Fujiki Y, Fukushima T, Ema H, Shibuya A, Nakauchi H. Comparison of hematopoietic activities of human bone marrow and umbilical cord blood CD34 positive and negative cells. Stem Cells 1999; 17(5): 286-294. Theunissen K, Verfaillie CM. A multifactorial analysis of umbilical cord blood, adult bone marrow and mobilized peripheral blood progenitors using the improved ML-IC assay. Exp Hematol 2005; 33(2): 165-172. Gluckman E, Rocha V, Arcese W, Michel G, Sanz G, Chan KW, Takahashi TA, Ortega J, Filipovich A, Locatelli F, Asano S, Fagioli F, Vowels M, Sirvent A, Laporte JP, Tiedemann K, Amadori S, Abecassis M, Bordigoni P, Diez B, Shaw PJ, Vora A, Caniglia M, Garnier F, Ionescu I, Garcia J, Koegler G, Rebulla P, Chevret S; Eurocord Group. Factors associated with outcomes of unrelated cord blood transplant: guidelines for donor choice. Exp Hematol 2004; 32(4): 397-407. Dexter TM, Lajtha LG. Proliferation of hemopoietic stem cells and development of potentially leukemic cells in vitro. Bibl Haematol 1975; 43: 1-5. Dexter TM, Testa NG. Differentiation and proliferation of hemopoietic cells in culture. Methods Cell Biol 1976; 14: 387-405. Dexter TM, Moore MA, Sheridan AP. Maintenance of hemopoietic stem cells and production of differentiated progeny in allogeneic and semiallogeneicbone marrow chimeras in vitro. J Exp Med 1977; 145(6): 1612-1616. Moore MA, Sheridan AP, Allen TD, Dexter TM. Prolonged hematopoiesis in a primate bone marrow culture system: characteristics of stem cell production and the hematopoietic microenvironment. Blood 1979; 54: 775-793. Hofmeister CC, Zhang J, Knight KL, Le P, Stiff PJ. Ex vivo expansion of umbilical cord blood stem cells for transplantation: growing knowledge from the hematopoietic niche. Bone Marrow Transplantation 2007; 39: 11-23. Zhai QL, Qiu LG, Li Q, Meng HX, Han JL, Herzig RH, Han ZC. Short-term ex vivo expansion sustains the homing-related properties of umbilical cord blood hematopoietic stem and progenitor cells. Haematologica 2004; 89: 265-272. Zhang J, Niu C, Ye L, Huang H, He X, Tong WG, Ross J, Haug J, Johnson T, Feng JQ, Harris S, Wiedemann LM, Mishina Y, Li L. Identification of the haematopoietic stem cell niche and control of the niche size. Nature 2003; 425(6960): 836-841. Zandstra PW, Conneally E, Petzer AL. Cytokine manipulation of primitive human hematopoietic cell self-renewal. Proc Natl Acad Sci U S A 1997; 94(9): 4698-4703. Yonemura Y, Ku H, Lyman SD, Ogawa M. In Vitro Expansion of Hematopoietic Progenitors and Maintenance of Stem Cells: Comparison Between FLT3/FLK-2 Ligand and KIT Ligand. Blood 1997; 89(6): 1915-1921. Yagi M, Ritchie KA, Sitnicka E, Storey C, Roth GJ, Bartelmez S. Sustained ex vivo expansion of hematopoietic stem cells mediated by thrombopoietin. Proc Natl Acad Sci U S A 1999; 96(14): 8126-8131. Drygalski A, Savatski L, Eastwood D, Klein J, Adamson JW. The rate of marrow recovery and extent of donor engraftment following transplantation of ex vivo-expanded bone marrow cells are independently influenced by the cytokines used for expansion. Stem Cells Dev 2005; 14(5): 564-575. Andre C, Hampe A, Lachaume P, et al. Sequence analysis of two genomic regions containing the KIT and the FMS receptor tyrosine kinase genes. Genomics 1997; 39(2): 216-226. Zheng Y, Sun A, Han ZC. Stem cell factor improves SCID-repopulating activity of human umbilical cord blood-derived hematopoietic stem/progenitor cells in xenotransplanted NOD/SCID mouse model. Bone Marrow Transplantation 2005; 35(2): 137-142. De Felice L, Di Pucchio T, Breccia M, et al. Flt3L enhances the early stem cell compartment after ex vivo amplification of umbilical cord blood CD34+ cells. Bone Marrow Transplant 1998; 22(Suppl 1): S66-S67. Solanilla A, Grosset C, Duchez P, et al. Flt3-ligand induces adhesion of haematopoietic progenitor cells via a very late antigen (VLA)-4- and VLA-5-dependent mechanism. Br J Haematol 2003; 120: 782-786. Ninos JM, Jefferies LC, Cogle CR, Kerr WG. The thrombopoietin receptor, c-Mpl, is a selective surface marker for human hematopoietic stem cells. J Transl Med 2006; 4: 9. Yagi M, Ritchie KA, Sitnicka E, et al. Sustained ex vivo expansion of hematopoietic stem cells mediated by thrombopoietin. Proc Natl Acad Sci USA 1999; 96(14): 8126-8131. Bordeaux-Rego P, Luzo A, Costa FF, et al. Both interleukin-3 and interleukin-6 are necessary for better ex vivo expansion of CD133+ cells from umbilical cord blood. Stem Cells Dev 2010; 19(3): 413-422. Murray LJ, Young JC, Osborne LJ, et al. Thrombopoietin, Flt3, and kit ligands together suppress apoptosis of human mobilized CD34+ cells and recruit primitive CD34+ Thy-1+ cells into rapid division. Exp Hematol 1999; 27(6): 1019-1028. Ueda T, Tsuji K, Yoshino H, et al. Expansion of human NOD/SCID-repopulating cells by stem cell factor, Flk2/Flt3 ligand, thrombopoietin, IL-6, and soluble IL-6 receptor. J Clin Invest 2000; 105: 1013-1021. Larochelle A, Vormoor J, Hanenberg H, et al. Identification of primitive human hematopoietic cells capable of repopulating NOD/SCID mouse bone marrow: implications for gene therapy. Nat Med 1996; 2(12): 1329-1333. Bhatia M, Wang JCY, Kapp U, et al. Purification of primitive human hematopoietic cells capable of repopulating immunedeficient mice. Proc Natl Acad Sci USA 1997; 94(10): 5320-5325. Cashman J, Bockhold K, Hogge DE, et al. Sustained proliferation, multi-lineage differentiation and maintenance of primitive human hemopoietic cells in NOD/SCID mice transplanted with human cord blood. Br J Haematol 1997; 98(4): 1026-1036. Levac K, Karanu F, Bhatia M. Identification of growth factor conditions that reduce ex vivo cord blood progenitor expansion but do not alter human repopulating cell function in vivo. Haematologica 2005; 90(2): 166-172. Piacibello W, Sanavio F, Severino A, et al. Engraftment in nonobese diabetic severe combined immunodeficient mice of human CD34(+) cord blood cells after ex vivo expansion: evidence for the amplification and self-renewal of repopulating stem cells. Blood 1999; 93(11): 3736-3749. Lewis ID, Almeida-Porada G, Du J, et al. Umbilical cord blood cells capable of engrafting in primary, secondary, and tertiary xenogeneic hosts are preserved after ex vivo culture in a noncontact system. Blood 2001; 97(11): 3441-3449. Gammaitoni L, Weisel KC, Gunetti M, et al. Elevated telomerase activity and minimal telomere loss in cord blood long-term cultures with extensive stem cell replication. Blood 2004; 103(12): 4440-4448. Tian H, Huang S, Gong F, et al. Karyotyping, immunophenotyping, and apoptosis analyses on humanhematopoietic precursor cells derived from umbilical cord blood following long-term ex vivo expansion. Cancer Genet Cytogenet 2005; 157(1): 33-36. Oswald J, Steudel C, Salchert K, Joergensen B, Thiede C, Ehninger G, Werner C, Bornhäuser M. Gene-expression profiling of CD34+ hematopoietic cells expanded in a collagen I matrix. Stem Cells 2006; 24(3): 494-500. Broxmeyer HE, Hangoc G, Cooper S, et al. Growth characteristics and expansion of human umbilical cord blood and estimation of its potential for transplantation in adults. Proc Natl Acad Sci U S A 1992; 89(9): 4109-4013. Piacibello W, Sanavio F, Garetto L, et al. Extensive amplification and self-renewal of human primitive hematopoietic stem cells from cord blood. Blood 1997; 89(8): 2644-2653. Robert-Moreno A, Espinosa L, De la Pompa JL, Bigas A. RBPjκ-dependent Notch function regulates Gata2 and is essential for the formation of intra-embryonic hematopoietic cells. Development 2005; 132(5): 1117-1126. Delaney C, Varnum-Finney B, Aoyama K, et al. Dose-dependent effects of the Notch ligand Delta1 on ex vivo differentiation and in vivo marrow repopulating ability of cord blood cells. Blood 2005; 106(8): 2693-2699. Delaney C, Heimfeld S, Brashem-Stein C, et al. Notch-mediated expansion of human cord blood progenitor cells capable of rapid myeloid reconstitution. Nat Med 2010; 16(2): 232-236. Peled T, Landau E, Prus E, et al. Cellular copper content modulates differentiation and selfrenewal in cultures of cord blood-derived CD34+ cells. Br J Haematol 2002; 116(3): 655-661. Peled T, Glukhman E, Hasson N, et al. Chelatable cellular copper modulates differentiation and self-renewal of cord blood-derived hematopoietic progenitor cells. Exp Hematol 2005; 33 (10): 1092-1100. Peled T, Mandel JL, Goudsmid R, et al. 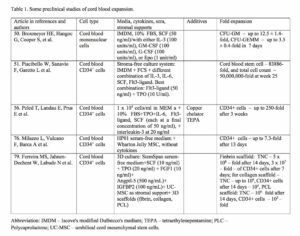 Pre-clinical development of cord blood-derived progenitor cell graft expanded ex vivo with cytokines and the polyamine copper chelator tetraethylenepentamine. Cytotherapy 2004; 6(4): 344-355. Peled T, Landau E, Mandel J, et al. Linear polyamine copper chelator tetraethylenepentamine augments long-term ex vivo expansion of cord blood-derived CD34+ cells and increases their engraftment potential in NOD/SCID mice. Exp Hematol 2004; 32(6): 547-555.
de Lima M, McMannis J, Gee A, et al. Transplantation of ex vivo expanded cord blood cells using the copper chelator tetraethylenepentamine: a phase I/II clinical trial. Bone Marrow Transplant 2008; 41(9), 771-778. Shpall EJ, Quinones R, Giller R, Zeng C, Baron AE, Jones RB, Bearman SI, Nieto Y, Freed B, Madinger N, Hogan CJ, Slat-Vasquez V, Russell P, Blunk B, Schissel D, Hild E, Malcolm J, Ward W, McNiece IK. Transplantation of ex vivo expanded cord blood. Biol Blood Marrow Transplant 2002; 8(7): 368-376.
de Lima M, McMannis JD, Saliba R, et al. Double Cord Blood Transplantation (CBT) with and without Ex-Vivo Expansion (EXP): A Randomized, Controlled Study. ASH annual meeting abstract. Blood (ASH Annu Meet Abstr) 2008; 112: Abstract 154. Jaroscak J, Goltry K, Smith A. Augmentation of umbilical cord blood (UCB) transplantation with ex vivo-expanded UCB cells: results of a phase 1 trial using the AastromReplicell System Blood 2003; 101(12): 5061-5067. Butler JM, Nolan DJ, Vertes EL, Varnum-Finney B, Kobayashi H, Hooper AT, Seandel M, Shido K, White IA, Kobayashi M, Witte L, May C, Shawber C, Kimura Y, Kitajewski J, Rosenwaks Z, Bernstein ID, Rafii S. Endothelial Cells Are Essential for the Self-Renewal and Repopulation of Notch-Dependent Hematopoietic Stem Cells. Cell Stem Cell 2010; 6(3): 251-264. Ding L, Saunders TL, Enikolopov G, Morrison SJ. Endothelial and perivascular cells maintain haematopoietic stem cells. Nature 2012; 481(7382): 457-462. Yildirim S, Boehmler AM, Kanz L, Mohle R. Expansion of cord blood CD34+ hematopoietic progenitor cells in coculture with autologous umbilical vein endothelial cells (HUVEC) is superior to cytokine-supplemented liquid culture. Bone Marrow Transplant 2005; 36(1): 71-79. Butler JM, Gars EJ, James DJ, et al. Development of a vascular niche platform for expansion of repopulating human cord blood stem and progenitor cells. Blood 2012; 120(6): 1344-1347. Raynaud CM, Butler JM, Halabi NM, et al. Endothelial cells provide a niche for placental hematopoietic stem/progenitor cell expansion through broad transcriptomic modification. Stem Cell Res 2013; 11(3): 1074-1090. Peters R, Wolf MJ, van den Broek M, Nuvolone M, Dannenmann S, Stieger B, Rapold R, Konrad D, Rubin A, Bertino JR, Aguzzi A, Heikenwalder M, Knuth AK. Efficient Generation of Multipotent Mesenchymal Stem Cells from Umbilical Cord Blood in Stroma-Free Liquid Culture. PLoS One 2010; 5(12): e15689. Koliakos I, Tsagias N, Karagiannis V, et al. Mesenchymal cells isolation from Wharton’s jelly, in perspective to clinical applications. Journal of Biological Research-Thessaloniki 2011; 16: 194-201. De Bruyn C, Najar M, Raicevic G, Meuleman N, Pieters K, Stamatopoulos B, Delforge A, Bron D, Lagneaux L. A rapid, simple, and reproducible method for the isolation of mesenchymalstromal cells from Wharton’s jelly without enzymatic treatment. Stem Cells Dev 2011; 20(3): 547-557. Kikuchi-Taura A, Taguchi A, Kanda T, Inoue T, Kasahara Y, Hirose H, Sato I, Matsuyama T, Nakagomi T, Yamahara K, Stern D, Ogawa H, Soma T. Human umbilical cord provides a significant source of unexpanded mesenchymal stromal cells Stem Cells Dev 2011; 20(3): 547-557. McNiece I, Harrington J, Turney J, Kellner J, Shpall EJ. Ex vivo expansion of cord blood mononuclear cells on mesenchymal stem cells. Cytotherapy 2004; 6(4): 311-317. Robinson SN, Ng J, Niu T, Yang H, McMannis JD, Karandish S, Kaur I, Fu P, Del Angel M, Messinger R, Flagge F, de Lima M, Decker W, Xing D, Champlin R, Shpall EJ. Superior ex vivo cord blood expansion following co-culture with bone marrow-derived mesenchymal stem cell. Bone Marrow Transplant 2006; 37(4): 359-366. Milazzo L, Vulcano F, Barca A, Macioce G, Paldino E, Rossi S, Ciccarelli C, Hassan HJ, Giampaolo A. Cord blood CD34+ cells expanded on Wharton’s jelly multipotent mesenchymal stromal cells improve the hematopoietic engraftment in NOD/SCID mice. Eur J Haematol 2014 May 3. doi: 10.1111/ejh.12363. [Epub ahead of print]. Himburg HA, Muramoto GG, Daher P, Meadows SK, Russell JL, Doan P, Chi JT, Salter AB, Lento WE, Reya T, Chao NJ, Chute JP. Pleiotrophin regulates the expansion and regeneration of hematopoietic stem cells. Nat Med 2010; 16(4): 475-483. Zhang CC, Kaba M, Iizuka S, Huynh H, Lodish HF. Angiopoietin-like 5 and IGFBP2 stimulate ex vivo expansion of human cord blood hematopoietic stem cells as assayed by NOD/SCID transplantation. Blood 2008; 111(7): 3415-3423. Ferreira MS, Jahnen-Dechent W, Labude N, Bovi M, Hieronymus T, Zenke M, Schneider RK, Neuss S. Cord blood-hematopoietic stem cell expansion in 3D fibrin scaffolds with stromal support. Biomaterials 2012; 33(29): 6987-6997. Tiwari A, Tursky ML, Kirkland MA, Pande G. Expansion of human hematopoietic stem/progenitor cells on decellularized matrix scaffolds. Curr Protoc Stem Cell Biol 2014; 28: 1C.15.1-1C.15.15.